Albinism is an inherited condition present at birth. It is characterized by a reduced or lack of pigment that normally gives color to the skin, hair, and eyes. Only one person in 17,000 is born with some type of albinism. Albinism affects every race. Most children with albinism are born to parents who have normal hair and eye color for their ethnic backgrounds. Albinism comes in many forms. 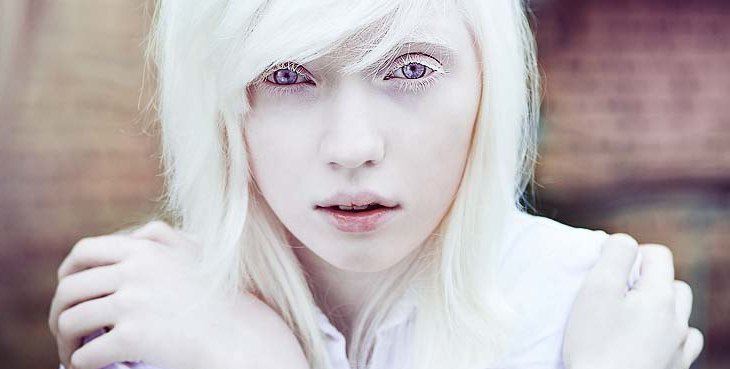 Some with albinism have white hair and very light blue eyes, some have blonde hair and blue eyes, and in some cases others even have brown hair and eyes. Albinism is a genetic condition passed from parents to their children. In most types of albinism, both parents must carry an albinism gene to have a child with albinism. Ocular albinism is a condition that reduces the coloring (pigmentation) of the iris; the colored part of the eye and the retina which is the light-sensitive tissue at the back of the eye. Pigmentation in the eye is required for normal vision. This genetic condition usually affects both eyes. There are many symptoms of Ocular Albinism. It is characterized by severely impaired sharpness of vision and problems with depth perception. Although the vision loss is permanent, it does not worsen over time. Additional eye symptoms include rapid, involuntary eye movements, known as nystagmus; or eyes that do not look in the same direction (strabismus); as well as increased photophobia (sensitivity to light). Many individuals also have abnormalities involving the optic nerves, which carry visual information from the eye to the brain. Vision acuity can range from normal for those who are minimally affected, to legal blindness (vision less that 20/200) or worse for those with more severe forms of albinism. Many times near vision is often better than distance vision. Typically, those with the least amount of pigment have the poorest vision. Ocular albinism is different that other forms of albinism because it does not significantly affect the color of the skin and hair. Although those with this condition may have a somewhat lighter complexion than other members of their family, these differences are usually very minor and often go unnoticed. Although Albinism is a lifelong condition, it does not worsen over time. Currently there is no way to treat poor or absent pigment production or correct abnormal vision development; however, proper eye evaluation and management can be very useful. Eye misalignment is treatable with glasses or surgery. Glasses can be prescribed to improve vision and reduce light sensitivity. Additionally magnifying glasses for reading and low vision aids for distance vision is also helpful. Previous post: What is Color Blindness? Next post: What is Retinitis Pigmentosa?